Mention ‘park’ to any visitor to Barcelona, and they immediately think of Parc Guell, Gaudi’s extraordinary masterpiece, visited by hundreds of thousands of tourists each year. The number of visitors is overwhelming; particularly around the key features of the park, and it is almost impossible to take a photograph without there being at least half a dozen people obscuring the view (even early in the morning). Also it is not an easy place to get to, being poorly signed and a good 20 minutes walk from the Metro, much of it uphill; which in Barcelona’s humid summer weather is truly a pilgrimage. 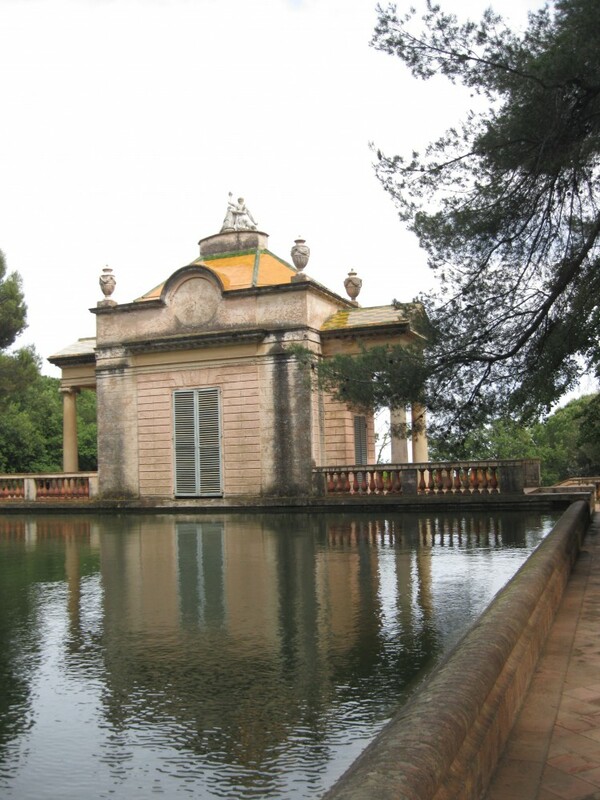 However, for my money, Barcelona’s most beautiful park is the equally inaccessible Parc del Laberint d’Horta, the former country estate of the Desvalls family. The 14th century house was heavily restored in Arabesque and Gothic styles in the 19th century, but now, unlike our pampered and cosseted heritage, one of the two main wings is abandoned, boarded up, and slowly rotting away. Next to the house, is a small and stylish topiary garden (a bit too fussy for my taste); but it is the late 18th century Neo-Classical and mid-19th century Romantic gardens that I had come to see. 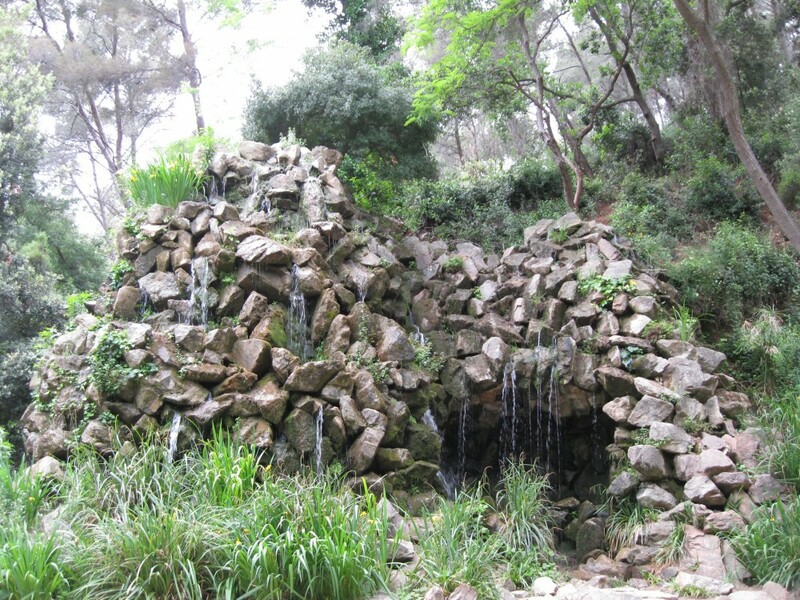 The gardens are in the ownership of Barcelona City Council, and have recently undergone a major restoration. In the Neo-Classical garden, three terraces have been carved into the steeply ascending hillside. 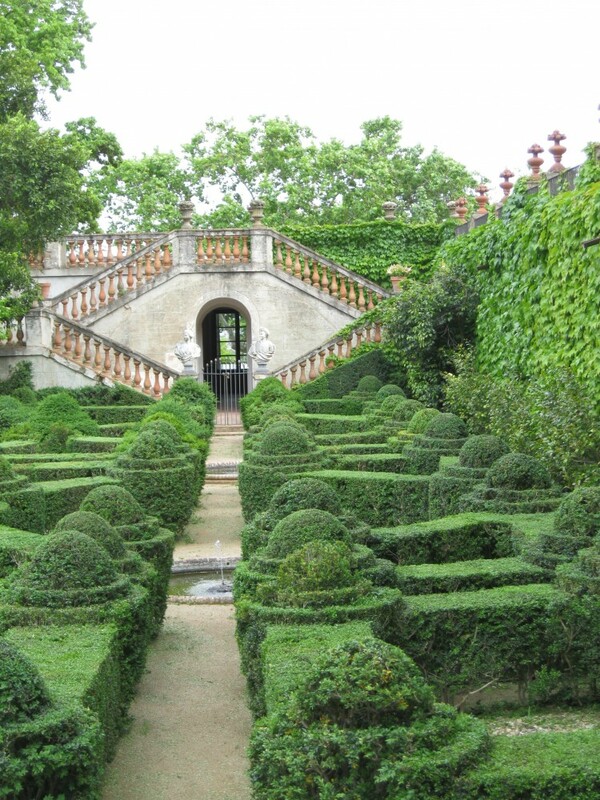 On the broadest terrace is a curious and distinctive labyrinth of trimmed cypress with oversailing loops, which can viewed from the two higher terraces. 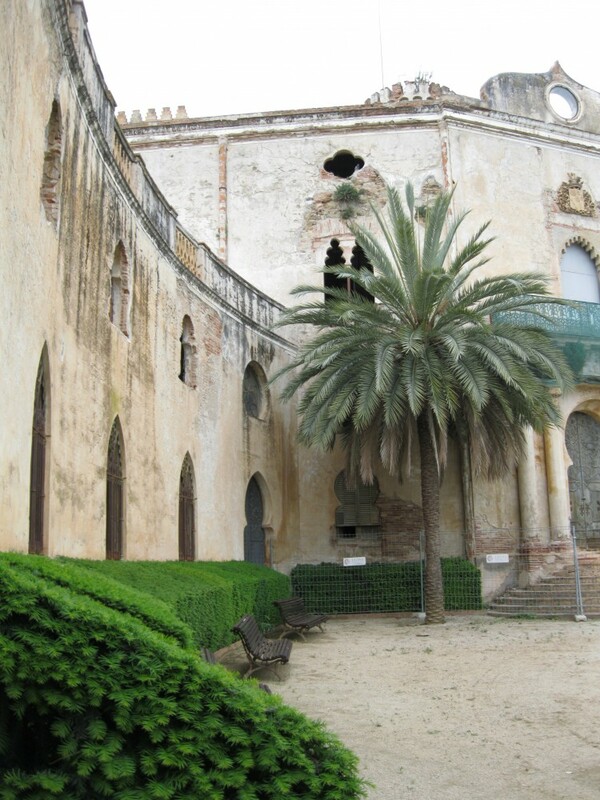 A grand stair rises to the middle terrace, with its pair of round symmetrically-placed Roman temples, and then to the upper terrace, with its large pavilion and water basin (which irrigates the garden). The classical statues of the garden allude to the theme of love, but you need to be a classical scholar to understand their terms of reference. The Romantic Garden is a steep ravine at the side of the Neo-Classical Garden, whose theme is death, but as far as I could see none of the symbolism remains. 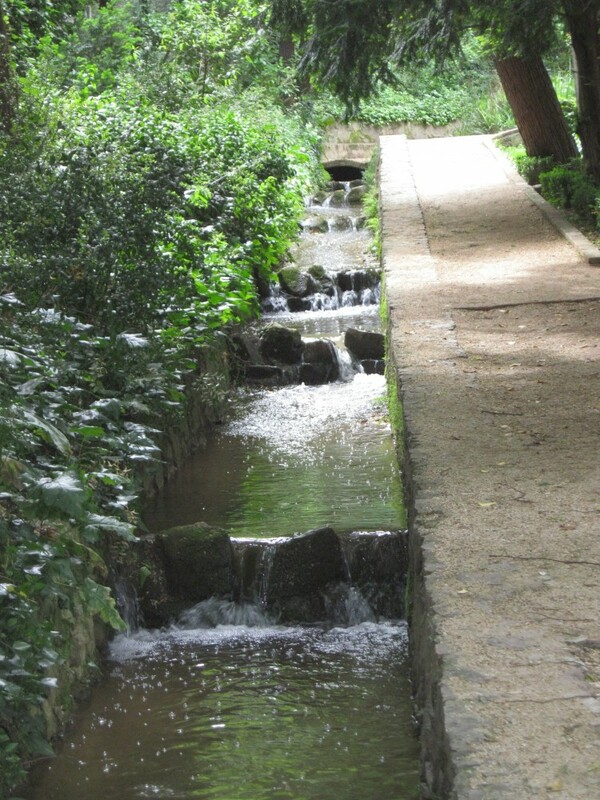 Once in the ravine, the main path ascends beside a cool, gushing and gurgling stream, falling over small waterfalls, beside huge box-edged beds of agapanthus and a series of ponds, under the canopy of native and exotic forest trees. At the head of the garden is a large incongruous pile of rock, that looks like a substantial piece fly-tipping, but from which jets of water spout, so I assume it must be part of the garden’s concept. Unlike Parc Guell, this is a garden where you are on your own, apart from a few dog walkers, and discreetly preoccupied lovers on the stone benches. 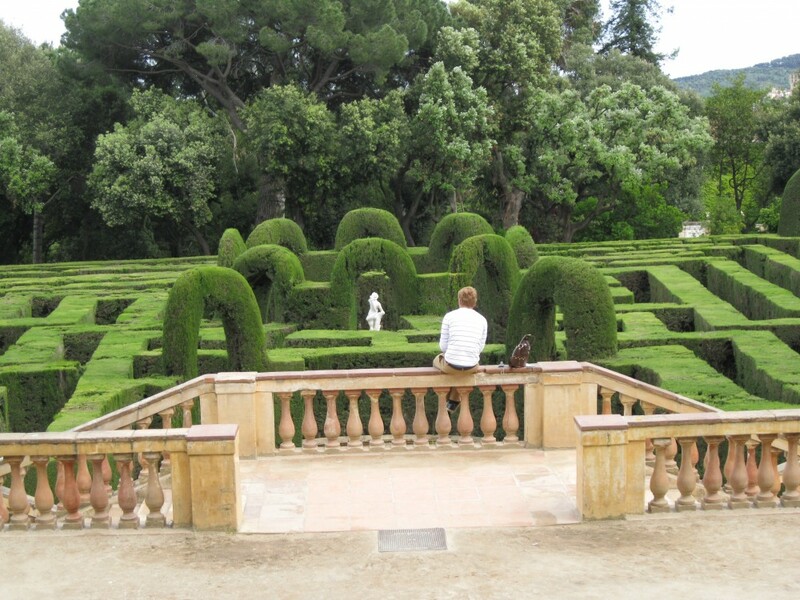 If you are tired of the city, Gaudi, shopping and the crowds, then Parc del Laberint d’Horta is a calm, tranquil escape from the hot Barcelona sun.